A night to raise awareness, much needed funds and have fun with good music into the bargain. Join us in a great night of Entertainment, raising vital funds and awareness of our amazing local charity. Inspired by local teenager Jak Trueman. 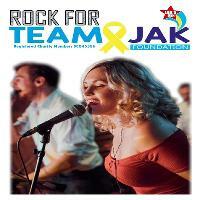 Team Jak Foundation aim to help ease the fear, lonliness and confusion of a cancer diagnosis or bereavement and ensure no-one feels isolated or alone. Through providing practical, emotional and social support to children and young people with cancer and related illnesses age 0 - 25, their families, friends and those bereaved of a child from cancer or children bereaved of someone from cancer. All this from the fantastic Jak's Den in Livingston.